PowerSchool Acquires Chalkable to Bring Positive Behavior Intervention and Classroom Culture into K-12’s Most Comprehensive Unified Classroom Solution - Berkery, Noyes & Co., LLC. 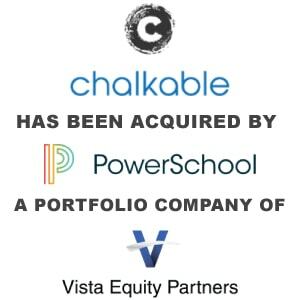 PowerSchool, the leader for K-12 education technology solutions, today announced the acquisition of Chalkable, a leading provider of a student achievement and regional education data management solution. Acquiring Chalkable further differentiates PowerSchool’s Unified Classroom Platform by adding innovative tools to reinforce positive student behavior in a single unified experience for teachers, students, and parents. PowerSchool’s expanded suite will further empower teachers and improve school culture by teaching students social skills that contribute to good character and a positive classroom environment. The acquisition provides PowerSchool with additional capabilities to track student behavior, an area of increasing need for educators. A recent report published by Scholastic and The Bill & Melinda Gates Foundation summarized results from a survey taken by more than 10,000 public school teachers. The report revealed that 62 percent of teachers say that behavior issues are the biggest interference with teaching and improving learning outcomes. It was also noted that teachers are committed to helping all of their students succeed, but need adequate resources to ensure student success. Chalkable’s development and implementation of its Positive Reinforcement System has improved student success rates by a number of measures in many schools. One of those noteworthy successes includes a school district with 30,000 students that achieved an 18 percent year-over-year decrease in absences, a 50 percent decrease in discipline infractions, and one third fewer classes failed after implementation of Chalkable’s Positive Reinforcement System. The incentive-based reward approach built into the Positive Reinforcement System helps curb negative behavior in the classroom by encouraging positive student behavior. Teachers can set goals for individual students or a whole class. When students achieve objectives, such as completing and turning in an assignment, improving test scores, or achieving attendance goals, they earn credits. Students can save their credits in a virtual bank account or spend them at the school store, where they can purchase rewards such as hall passes, free time or lunch with the teacher, or even tangible rewards such as school supplies, snacks, clothes, music, games, and movie passes. Chalkable also enhances PowerSchool’s strong federal and regional student information system compliance coverage in a number of states, such as Alabama, Illinois, Missouri, Mississippi, Tennessee, Oklahoma, and more. Chalkable customers have PowerSchool’s commitment to ongoing development, innovation, support, and service of Chalkable’s suite of products. Additionally, Chalkable customers have the option of adopting new technologies from PowerSchool, such as online registration, and the unified classroom—a complete integrated application for grading, learning management, assessment, analytics, and special education. PowerSchool is the #1 leading education technology platform for K-12, serving more than 23 million students, 41 million parents, and 65 million users in over 70 countries around the world. We provide the industry’s first Unified Classroom experience with best-in-class, secure, and compliant online solutions, including registration and school choice, student information systems, learning management and classroom collaboration, assessment, analytics, and special education management. We empower teachers and drive student growth through innovative digital classroom capabilities, and we engage families through real-time communications across any device. Visit http://www.powerschool.com to learn more. Chalkable is a leading provider of education data management, student achievement and professional learning solutions to the K-12 public and private school markets. In partnership with states, districts, schools and educators, Chalkable helps students succeed by breaking down the barriers to learning across the K-12 ecosystem and facilitating collaboration, access to information, and effective use of tools to improve student performance. More than 5,000 schools in 50 states use Chalkable solutions. For more information, visit http://www.chalkable.com.